For Immediate Release: Posted On 4/27/2010 By Industrial Magnetics, Inc. The Pneumatic Line Housing (PLH) is suitable for processing dry, powder, and granular materials in dilute phase systems and is configured with a series of 1 inch dia., 50 MgOe rare-earth tubes on staggered centers. This design ensures that all product flowing through the housing makes repeated contact with the magnets and results in a capture rate of ferrous and weakly magnetic stainless contaminants that far exceeds any other magnetic separator available for this type of application. The PLH is also available as a Self-Cleaning, sealed unit which eliminates line pressure drops and surges, is leak-proof up to 15 PSI and eliminates the need for operator-required cleaning of metal contamination. IMI’s Bullet Magnet® is also used in dilute phase systems and is commonly utilized ahead of processing equipment and bulk load out to assure product purity and protect machinery from tramp metal damage. Aerodynamically shaped with a solid, stainless steel nose cone diverter, the flow-thru design of the Bullet Magnet® maintains uniform velocity in- line flow, allowing it to be used anywhere in the pneumatic system. Bullet Magnet® applications include: movement of powder and granular, flour, chemical, plastic, food stuff, pharmaceutical and mineral materials. The Exposed Pole Tube Magnet is utilized in pneumatic line applications where product degradation is a concern, with fibrous products, or products that have a higher moisture content with a tendency to clog or congeal. The EP Tube consists of a rare earth magnet on a hinged door, which allows the magnet to be swung out of the product flow for cleaning collected tramp metal. 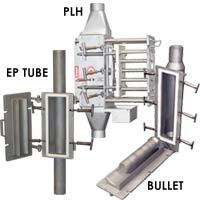 Applications include the processing of pelletized foods, feed or grains.